I read and enjoyed the first book in the Banktoun trilogy last year – you can read my review here: Black Wood I think that Willow Walk is even better. Willow Walk begins with a woman waking up to a scene of horror the morning after a party and stumbling away from the house in shock. Sergeant Davie Gray is called to a hospital where a young woman has been left severely injured in a vicious attack. Add in some deaths linked with legal highs which Davie is also investigating, and his girlfriend’s odd behaviour and the quiet town of Banktoun does not seem such a peaceful place after all. SJI Holliday has brilliantly created an atmosphere of menace which lasts from the beginning of this book right to the end. What Davie doesn’t know is that Marie’s behaviour is linked to the re-emergence of someone from her past, someone who nobody else knows about and someone she thought she had left behind. Like Marie, I felt so uneasy reading each letter she received. There was a real sense of danger which, not surprisingly, had Marie jumpy and looking over her shoulder all the time. I couldn’t help but feel sorry for Marie and what she had been through in her early years. The letters were a brilliant addition to the story giving a real insight into the disturbed mind of their author, Graeme. Through the letters we also find out a little of what has happened in Marie’s past and the reason why she is now so scared. You can really empathise with her confused and conflicted feelings. 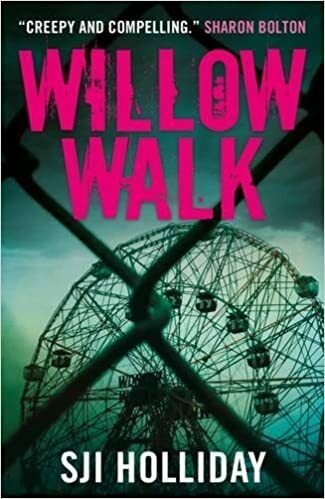 Willow Walk is a compelling thriller, full of tension throughout, with vividly described characters and settings. Can’t wait to read the last in the Banktoun trilogy and I hope that SJI Holliday is busy writing it already! My thanks to Laura at Black and White Publishing for inviting me to read and review this book. Willow Walk was published as an e-book on 5th May and is available in paperback from June 10th. The publishers have kindly offered a paperback copy for me to giveaway – details below – but if you aren’t lucky enough to win, it is currently only 98p to order the e-book here: Willow Walk The giveaway is open until midnight on Tuesday 7th June and the winner will be notified within 24 hours. Reading this right now and loving it! I’m not a fan of either!